I traveled to Nashville in August for a conference, and the city’s reputation as a music center made me think I would sink a lot of cash shopping for records. 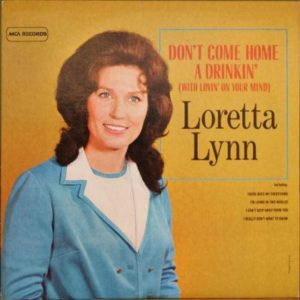 I did, however, come away with a battered copy of Don’t Come a Drinkin’ (With Lovin’ on Your Mind) by Loretta Lynn. Every cable channel music documentary that features Lynn always mention two songs — “The Pill” and the title track of Don’t Come Home a Drinkin’. Both songs got Lynn in hot water with the tender sensibilities of country radio. It’s actually not the most confrontational track on the album. That would go to “I Got Caught” — a bouncy, scathing tune about infidelity that also comments on gender inequality. That is, men can get away with cheating, but women cannot. Most of my country music collection consists of Emmylou Harris albums, and she was the first artist to sink a lot of cash into making quality-sounding records. Lynn, by contrast, cut her teeth in an era when artists recorded an entire album of material in three days. The speed at which she tosses out one broken-hearted ditty after another is breathtaking. With no track exceeding three minutes, there’s an almost punk rock sensibility to Don’t Come Home a Drinkin’. Lynn makes her point right quick — you’re no good, I’m sad, but I will prevail.